Are you an avid wine drinker? 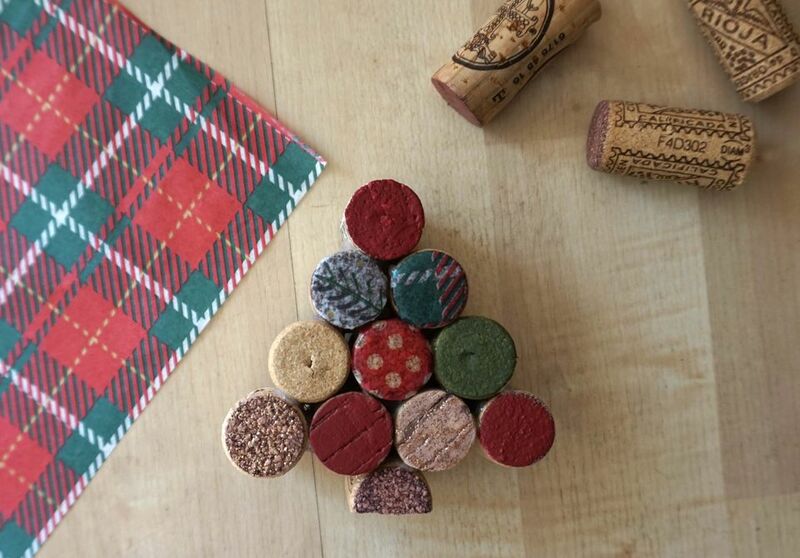 Instead of tossing out cork after cork, collect them to create this adorable holiday-themed DIY. Upcycled wine cork Christmas tree decorations are adorable home accents. They make lovely, one-of-a-kind hostess gifts, too, and they fit nicely in a stocking (wink, wink). Did we mention this craft is budget-friendly? Especially if you provide the wine corks yourself over time or gather them from friends. Plus, it’s a nice excuse to drink that pinot you’ve been saving. Choose three different patterns or colors of tissue paper to create an interesting, decorative tree and cut out one circle from each. To get an accurate size and shape, you may want to trace the head of your wine cork onto the tissue paper with a pencil before cutting. This step isn’t completely necessary, though, as excess paper can be easily hidden during the following steps. Use a paintbrush and decoupage medium, like Mod Podge, to the head of three wine corks. These will be the corks adorning your decorative tissue paper. Once you’ve added your decoupage medium, stick the tissue paper on top. Place the tissue paper circle centered onto the head of your wine cork. Then, apply another coat of decoupage medium over top with a paint brush. If there is excess tissue paper hanging over the edge of your cork, simply apply extra decoupage medium and use your paint brush to fold it over the sides of the cork. Allow these corks to dry for at least two hours. The decoupage medium should dry clear, revealing your newly-patterned corks. Choose three festive acrylic paint colors to use on your tree and choose 3 to 5 corks to be painted. Then, use a paintbrush to lightly paint the heads of each of your chosen corks—use a different color of paint for each one. The result? A handful of adorable, whimsical corks. Allow these to dry before moving onto the next step. You need one non-decorated cork to act as your stand, like the stump of a tree. This cork will allow your tree to stand up on its own. To accomplish this, you will need to carefully use a sharp knife to cut one of your corks in half lengthwise. Steaming your wine cork beforehand makes cutting it significantly easier. Fill a pot with about two inches of water and place it on your stove to bring to a boil. Once it’s boiling, place a steamer basket on top and toss one wine cork in. After about 10 minutes of steaming, your cork should be much easier to slice. Before gluing, it may be a good idea to arrange your corks into a tree shape to test out different patterns and ensure your finished product looks just how you imagined. The base of the tree will be a row of four corks, with three corks in the next row, two in the next, and one on top. The bottom of your tree does not need to be patterned. Plug in your hot glue gun for a few minutes and, once it’s nice and hot, get to gluing. If you arranged your corks beforehand, this step should be easy. Just apply a generous amount of hot glue between each cork—first glue four in a row together, then three, then two. Next, glue all rows of corks on top of one another by adding a generous amount of hot glue to the bottoms of the individual corks. Add hot glue to the single cork that’s left and attach it to the top of your soon-to-be-tree. To finish, apply glue to the circular portion of your halved wine cork and attach it to the rest of the tree. Voila! Now you’ve made your own DIY wine cork Christmas tree. This festive decoration makes the perfect holiday addition to your mantle—or any surface really—but also works great as a gift. Whatever you do with it, you’re sure to feel proud when you see your up-cycled knick knack.